Once you’ve found your perfect recruit after a long-winded recruitment process, it’s time to start salary negotiations. If you’re lucky, your new hire won’t negotiate at all. Latest research from the US suggests less than 40% of candidates ask for more that advertised, and it’s likely even fewer Brits would do the same, given our ingrained hatred of haggling. Perhaps, however, we’re just better at coming up with the right salary offer in the first place? Read on to see how you can improve your tactics to ensure that you secure your chosen candidate. What’s the big deal about getting the salary offer right? Well, the obvious answer is you don’t want your ideal candidate to walk away before you’ve even had a chance to negotiate. However, it’s also down to trust and expectation. After maybe one, but probably at least two interview stages, they’ve no doubt told you what their previous salary was, and what their expectations are now. By this point, you’ve also probably outlined the salary bracket applicable to the role. Money is emotive to both parties, and you only get one chance to get it right. So, to come up with something much lower than discussed or advertised, aka ‘lowballing’, smacks of an underhand, cheap budget grab and will leave the candidate feeling devalued. Therefore, don’t be surprised when your offer is declined, they walk away and block your number forever. It just makes your organisation look amateurish, and if the candidate does walk away, it’s just the sort of story that gets passed around. You don’t want to be the company with a reputation for trying to ‘stitch up’ new staff. Thirdly - you risk colleagues finding out about this new pay level – and demanding a pay rise themselves. Before you know it, you could have a full-scale pay revolt on your hands. What factors should determine your initial salary offer? Bonuses will give you some wiggle room when it comes to salary negotiation. If you have a discretionary bonus scheme, one that does not appear in a contract, then you can dangle this ‘carrot’ as a way of suggesting your new hire might be able to top up their take-home pay at the end of the year. Or you may have a non-discretionary scheme written into the contract, but the ‘carrot’ might be just as ‘juicy’. In sales roles, it is expected that a significant proportion of an employee’s take-home pay relates is commission. The commission scheme is often based both on individual and team/company-wide performance. How you present the overall earning potential at this point might also be enough to persuade your potential recruit to sign along the dotted line. This article explains more on creating commission schemes and the ‘golden rules’ that you must follow. If you’re still at an impasse, does your business allow discretion on holiday days? Could you offer the candidate a clear, fast-tracked career path to a high-paid promotion within a set time… providing they proved themselves, of course. It could be that giving something as simple as formal training/qualifications, or flexible working, might do the trick. However, you’ll need to guard against the whole workforce finding out and demanding the same treatment and perks. 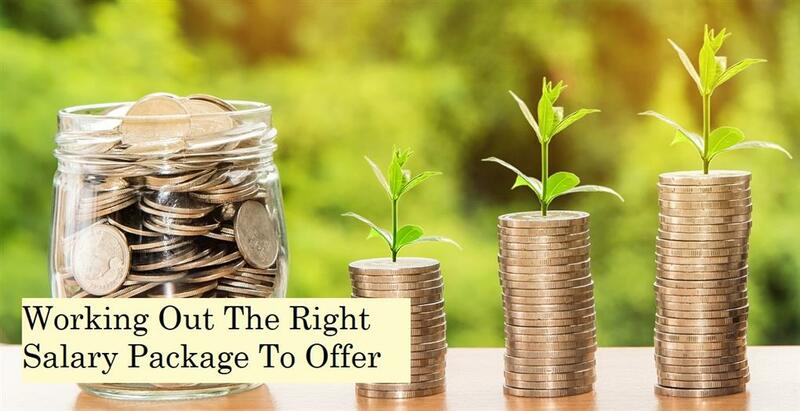 Of course, your ideal solution is that you already have a pay bracket in mind, one agreed with the management, and just increasing the offer a little, still within the top bracket, is enough to seal the deal. How do you offer a salary? Remember that many new recruits WON’T try and negotiate! Once you’ve agreed verbally, then make the formal written offer, together with the package clearly laid out, with basic wage, commission structure (and how it works), bonus scheme (if applicable), pension, holidays etc. The job offer should also mention the position, the name of the line manager to whom the recruit will report, and other terms and conditions of employment. And then, finally, you’ll get their signature and agree on a starting date! Hopefully, you will have negotiated yourselves into a win-win situation, with both sides of the salary negotiation looking forward to beginning a mutually beneficial and long-term relationship. If you both acted professionally, then it bodes well for the future.